This will be the subject of the talk on MONDAY 15 APRIL, 8pm at Knowle Village Hall – all welcome. It will be given by the Founder, Jan Harrigan. Jan began the Centre after a beautiful male swan crash landed, and as a result had a broken wing. 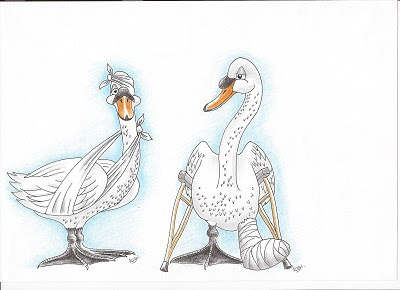 Fortunately for this swan Jan nursed him back to health. Little did she realise that this would be the birth of Wychbold Swan Rescue, and a lifetime’s work for which she would be honoured in 2004 with the MBE by her Majesty the Queen. You may remember that we encouraged you to recycle your Christmas Cards this year. This is the result!! The team at Thomas Bragg & Sons Funeral Directors in Solihull collected a staggering 30,000 Christmas cards for recycling to raise funds for St Giles Hospice. They smashed their 10,000 target as news of their collection spread through social media, posters, newsletters and even a man who stood up on a local bus and urged passengers to take their cards to Thomas Bragg’s. Thrilled Funeral Arranger Kayleigh Hughes explained: “After a successful Christmas Card collection of 5,112 cards from 2017, this year we aimed to receive 10,000 cards. “We decided again this year that for every 2,000 cards we collected we would dedicate a new tree via The Woodland Trust. One tree can provide 8,333 sheets of paper and we have now dedicated a quarter of an acre of woodland at Uffmoor Wood. Kayleigh thanked local businesses including Sainsbury’s in Shirley, One Stop and Tesco in Knowle as well as The Knowle Society and local churches for promoting their collection. She added: “We cannot thank the community enough for their support, the response has been amazing. We emptied the collection box at Knowle Parish Church four times and we had cards that were delivered by post from Cheshire. Cards are still coming in. Sally Insley, Community & Corporate Fundraising Manager from St Giles Hospice, said: “We would like to thank Thomas Bragg for their incredible efforts in collecting Christmas cards and gaining the support of the local community.